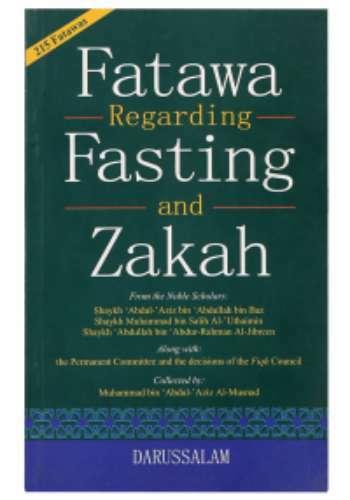 From the Noble Scholars Shaykh Abdul Aziz bin Abdullah bin Baz, Shaykh Muhammad bin Salih Al Uthaimin and Shaykh Abdullah bin Abdur Rahman Al Jibreen are 215 Fatawas on Fasting and Zakah that have been carefully compiled by Muhammad bin Abdul Aziz Al Musnad and published in a book form by Darussalam. This amazing book speaks on almost all of the major issues that Muslims from around the world face when it comes to fasting and paying zakah. Featuring a facilitating and detailed table of contents, this book breaks the Fatawas into two categories namely, Book of Fasting and Book of Az Zakah. The Book of Fasting gives rulings on prominent and recurring issues about the behavior of Muslims while fasting, their relations with family members, dealings with people at work and many other personal problems. It also answers private problems women have to deal with while fasting. The Book of Az Zakah clarifies many common and uncommon misunderstandings related to Zakah (obligatory charity in the way of Allah). It explains the importance of Az Zakah and who should pay it. It tells us whether Zakah is to be paid on the monthly salary or not whether it is to be paid on wealth that is kept for marriage. Other Zakah related questions answered by this book include payment of zakah on houses and cars, real estate properties or places used for business, cars that are kept for rentals, zakah on jewelry, religious donations and loaned wealth along with many others. It also sheds light on people zakah should be paid to and things on which there is no zakah to be paid.